WASHINGTON, Jul 2 2013 (IPS) - President Barack Obama on Monday announced a series of new initiatives to combat spiking levels of international poaching and draft a new national plan on wildlife trafficking, an industry that has grown so significantly in recent years that the president now calls it an “international crisis”. According to an executive order issued by the president Monday, the United States will now make available millions of dollars for strengthened coordination and training of personnel in developing countries. Of this, 10 million dollars will be earmarked for Africa, where President Obama is currently on an eight-day tour. Over the past few years, poachers have killed record numbers of elephants and rhinoceroses, particularly in Africa. Analysts and lawmakers are warning that this illicit industry has now been firmly taken over by international organised crime and militant groups armed with high-tech weapons and tools. “Poaching operations have expanded beyond small-scale, opportunistic actions to coordinated slaughter commissioned by armed and organized criminal syndicates,” Obama said in the executive order. Under Obama’s initiative, significant new focus will also be placed on regulations here in the United States, which is second only to China as the largest market for illegally trafficked wildlife products. The president has ordered the creation of an interagency task force and an external advisory council, both of which will now look into how pertinent U.S. regulations can be tightened and strengthened. The president issued the new order while in Tanzania, widely considered one of the hotspots of the illicit ivory trade. According to figures offered Monday by White House officials, worldwide wildlife trafficking could be bringing in upwards of 10 billion dollars a year, while others have suggested that figure could be almost twice as much. “This U.S. high-level attention will help raise the global profile of wildlife trafficking,” Allan Thornton, president of the Environmental Investigation Agency (EIA), an advocacy group, told IPS in a statement. According to some estimates, wildlife trafficking is now the fourth-largest transnational crime in the world, yet has never been attacked with the focus or resources of other such crimes. The task force, to be headed by the Interior, Justice and State Departments, will now draft a new national strategy on wildlife trafficking within the next six months, aimed at both “combating trafficking and curbing demand”. Obama has given specific instructions that it should look specifically at how to use U.S. anti-organised crime legislation in the fight. “In the last few years, wildlife trafficking has really exploded in terms of scale and also in terms of the types of poachers and organised crime networks that are involved in this activity … particularly in Southern Africa and East Africa, it’s reaching epidemic proportions,” Grant Harris, the senior director for Africa for the U.S. National Security Council, told reporters Monday. Harris noted that smugglers are receiving some 30,000 dollars per pound for a rhinoceros horn – “literally more valuable than its weight in gold” – and that global rhino populations have dropped by more than 90 percent over the past half-century. Likewise, some 30,000 elephants were killed in Africa last year alone, the highest number in two decades. The illicit trade in ivory is thought to have doubled just over the past six years, driven by new Internet-fuelled sales and growing market demand (and power) in rising economies, particularly China. “These syndicates are robbing Africa of its wealth,” Carter Roberts, president of the U.S. office of the World Wildlife Fund (WWF), said Monday. The move comes just two months after the United Nations officially characterised international wildlife and timber trafficking as a serious organised crime. That resolution was put forward by the United States and Peru, in line with what the National Security Agency’s Harris characterises as a new “massive diplomatic campaign” by Washington. 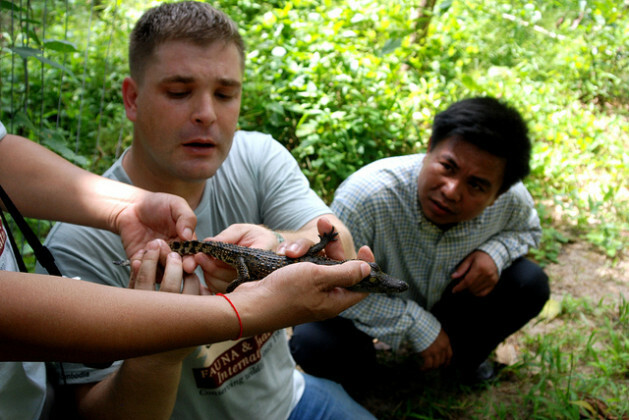 This focus is driven in part by the security threats posed by wildlife trafficking. “It’s a security issue. As we see criminal networks getting increasingly involved, you see poachers with night-vision goggles and high-powered rifles,” the Harris noted. According to a new report from the International Fund for Animal Welfare (IFAW), militia groups in Somalia and Sudan are funding their operations in part by trading ivory for weapons. It also notes reports that militants aligned with Al-Qaeda have been similarly tapping into illegal wildlife trading through South and Southeast Asia. IFAW suggests this lucrative trade has been made possible by ineffective national and international legislation and decades of indifference towards the issue by law enforcement. “Compared to other transnational criminal activities, the low risk of detection, relatively small penalties, and minimal consequences for perpetrating wildlife crime are attractive incentives to participate in illegal trade in wildlife,” the report, released in June, states.